← I guess Steak and Ale was taken? I’m…not quite sure how to take this. Is this really something you can buy? No, silly! It’s just a PhotoShopped fake image I made up. I was jogging the other day and, being a nerd, was thinking “What if I got mugged and had to punch someone in the face? My iPod would break! 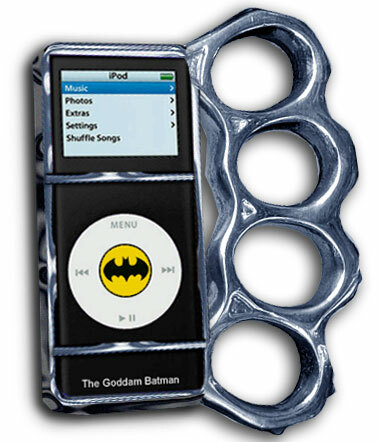 They should make an iPod holder with brass knuckles. And if they did, do you know who would own one? Batman, that’s who!” And it kind of went from there. Does this pair of brass knuckles come in Robin version? I don’t think I am worthy enough to pose off of Batman. Brass knuckles in cheery red, green, and yellow? The criminals would fall over laughing before you could ever hit them! Oh yeah, that’s right. Noone could even stand against the deadly Robin Gauuntlent. They be too busy on the ground giggling to their deaths.